Certas Energy has become an official partner of the Northern Powerhouse, joining the partnership to support improvements in fuel efficiency, transportation and air quality in the North. “We are extremely proud to be an official partner of the Northern Powerhouse, demonstrating our commitment to providing innovative alternatives to traditional fuel supply and management solutions that support improvements in efficiency and productivity,” said Brian Worrall, director of corporate affairs. 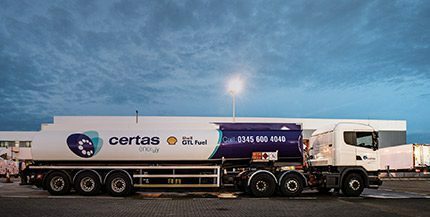 As part of its drive to encourage the adoption of smarter fuel solutions, Certas Energy has been pioneering the use of a cleaner burning alternative to diesel, as exclusive UK distributor of Shell GTL Fuel. Working in partnership with Peel Ports Group – a fellow member of the Northern Powerhouse Partner Programme – Certas Energy opened a Shell GTL Fuel refuelling station at the Port of Liverpool last year to provide HGV drivers with a lower emission fuel to help fleet operators assist in the improvement of local air quality. Certas Energy joins over 170 businesses and organisations who have already signed up to the Partner Programme based on their belief in the economic potential of the North and, support the need for a combined effort by government and business to realise that potential.